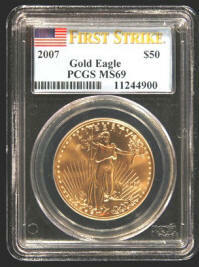 The gold $50 American Eagle coin sells for a premium over the current gold price. Often considered as one of the world's most beautiful gold coins. Each coin depicts the Liberty design by Augustus Saint-Gaudens on the obverse. The "family of eagles" design on the reverse gives these coins the nickname "gold eagles". Minted and backed for accuracy of weight and purity by the United States Government Mint. Each is legal tender of the US government and made of real gold. Announcement: We are in the process of gradually moving inventory to our new web shopping cart found at LynnCoins.NET Please visit and bookmark our new site. Over 350 years ago the 22 karat purity standard was established for circulating gold coinage. 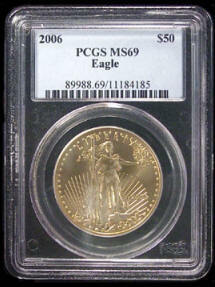 The American Eagle gold coins follow this standard. For example, if a ($50) American Eagle eagle coin was melted and the gold removed, you would have exactly 1 full ounce of pure gold. First Strike* ! 2007 First Strike* ! Mint state 69 - Gem Brilliant Uncirculated. 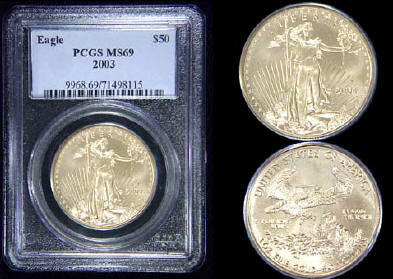 In PCGS holder (slab) - PCGS serial numbers will vary. First Strike* ! 2006 First Strike* ! Each Sealed Box of Gold, Silver and Platinum Eagles from the United States Mint contains a tape or seal that is dated and signed by an employee of the U.S. Mint. The date determines whether the coin is one of the first strikes (from the first sets shipped from the US mint). 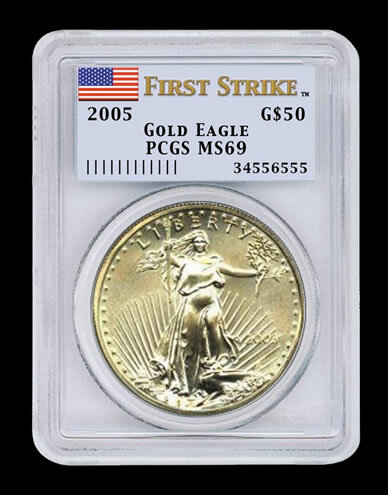 On these limited coins, PCGS will seal the coin in their "First Strike" plastic slab holder with the words " First Strike" inside the PCGS holder. For other US Mint coins that are not date sealed by the mint, those shipped by the Mint during the first month after the coin is issued are considered first strikes. Sealed in a tamper resistant protective holder (slab). Date on coins vary, depending on what we have in inventory. Photo shows a typical coin in and out of a sealed PCGS type holder. You may order up to the number we have in stock. Shipping and Postal Insurance is FREE ! Before ordering, please read ordering instructions below. Photo shows a typical coin - serial numbers will vary. Prices are subject to change daily and quantities are limited. See our other web pages for smaller size uncirculated and proofs. and their certification of authenticity and grading - Click here. Please read the following before placing your order. A. Use our store shopping cart or send payment directly from PayPal. Our webstore shopping cart is a PayPal compatible cart. When you choose "checkout", it should take you to Paypal's secure website for you to make the payment. You can also can send payment directly from Paypal's secure website using our email address of jlynn@aeneas.net by clicking on the Paypal "send money" tab. Current PayPal users - your address must be "confirmed" with PayPal for us to accept your PayPal payment. New users - Paypal accepts payment to us when you use your Visa or Master Card credit cards, as long as they can confirm that your credit card billing address matches your order shipping address. (Some credit card companies will confirm addresses, others won't.) They may also put a maximum limit on the total amount of payment you can make in a given month. Example, $2,500. B. Mail money order, cashier's check or personal check. We gladly accept payment by money orders, cashier's checks and personal checks. To order and mail such payment, begin by emailing us with the quantity and a description of what you would like to order. Confirm the order with us before mailing payment (per instructions above). Include your mailing address and phone number where we can reach you, in case a problem arises. Shipping address must be in the USA. Please see "How your order is shipped" (below) for more details. Mail your payment promptly. It must be postmarked within 3 business days of the confirmation and must arrive no later than 10 calendar days from confirmation date. Please Note: We mail your order after "our bank" notifies us your payment has cleared. Money orders and cashier's check usually clear the fastest. Time frame can vary between 7 and 15 business days from date we receive payment. (How long it takes may depend on how far away our banks are from each other.) We gladly accept personal checks. However, we can only mail orders to the checking account address "on record" with your bank. If you have recently moved and not notified your bank of your new address, payment by check can not be processed. In such situations please make payment by money order or cashier's check. Some find it refreshing that our word is our bond. It goes without saying, if someone confirms an order and does not send payment, he/she should not expect to do business with us again. Thank you. There is no minimum order requirement for the one ounce gold coins. You may order one or more, up to a maximum of 10 gold ounces at a time. You may also add other items from our web store to your order. However, at the current time we do not process orders for more than 10 ounces of gold at a time. Why? The answer is a practical one. Selling one ounce gold coins is more of a service for our customers than a "for profit" business. It takes a large amount of money to stock a quantity of 1 ounce gold coins. If we stocked enough gold for many large orders, our wide variety of other gold and silver coins would be limited. Even though we have a maximum of 10 gold ounces per order, you are welcome to place additional orders once an order has been shipped. Please do not "mail" a payment to us without first confirming your order. Even though we charge a low shipping fee, all orders for one ounce gold coins are fully insured during shipment. They will come to you by post office insured or registered insured first class mail, and must be signed for when delivered. We do not mail orders to addresses outside of the USA. APO & Military addresses: Some military addresses (APOs etc.) restrict the shipment or insurance of gold bullion or gold coins. If you have an overseas military address, please inquire with us before ordering. Orders paid with PayPal (credit card shopping cart, e-check, or directly from PayPal's website) are usually mailed within 48 hours of receiving "confirmed" funds through PayPal. We do not accept Paypal payments for one oz. gold coins, if your Paypal account does not have a "confirmed" address. To confirm your address with PayPal you must have a charge card with the same billing address as your shipping address, or respond to PayPal's confirmation post office mail letters. We wait until "our bank" notifies us that funds have cleared before shipping any orders. Time frame can vary from 7 to 15 business days from date we receive payment. Basically, it depends on how far away our banks are. Despite the time delay, rest assured your order is "locked-in" at the confirmed price. (We will not come back to you and tell you to send more money, if gold should move up during this time.) Money orders and cashier's check usually clear the fastest. We gladly accept personal checks. However, we can only mail orders to the checking account address "on record with your bank". Once your order has been placed in the mail, we will email you to let you know it is on the way. Because most customers prefer to be notified when we run across a special deal, we will include you in our preferred customer email list. At any time you may choose not to be added to (or may be removed from) our preferred customer email list. All items are guaranteed genuine. Exchanges may be made within 30 days, if there is a problem with the item received. Returns may also be made within 30 days, but are subject to a possible restocking fee equal to the change in market value of gold (or silver) from the time you ordered. Please note: We sell these gold coins at prices very close to our cost. Because of this, prices may change without advance notice and are subject to early sell out. Quantities are limited. We attempt to keep prices on this page up-to-date. However, internet server delays and other unexpected issues can impact our ability to do so. In the event that you order something using our shopping cart that we can no longer supply at the listed price, we will notify you promptly. Orders shipped to addresses within the USA only. Copyright 1999-2014 JLYNN Thank you for visiting us at http://lynncoins.com No inventory is kept on the premises.